Why would I need self storage in Jupiter, FL? There are a variety of reasons why you might need self-storage in Jupiter, FL. How much is a storage unit in Jupiter, FL? The cheapest storage unit in Jupiter, FL is $69.00 per month. What size storage units do you have available in Jupiter, FL? In Jupiter, FL we have sizes that range from 5'x5' to 10'x25' to suit your storage needs. How much is it for a 5'x5' storage unit in Jupiter, FL? The cheapest 5'x5' storage unit in Jupiter, FL is $69.00 per month. Jupiter is among the northernmost cities counted in the Miami, Florida, metropolitan area, spreading just over 20 miles along the Atlantic coastline. The city has grown exponentially in recent years, attracting a number of people with its seaside location, scenic views and numerous amenities. Jupiter has also been named one of the happiest coastal towns in the nation by the national publication "Coastal Living." The area where Jupiter is now located started off as part of the Hobe Native American tribal lands. On their maps, Spanish explorers labeled the area "Jobe," the Spanish spelling for the name of the tribe that called it home. However, through a series of misunderstandings, the name was recorded as "Jove." Mapmakers assumed that this was a tribute to the Roman god, Jove, eventually switching the city's name for its Roman equivalent, Jupiter. In 1838, Fort Jupiter was built in the area, and after that the Jupiter Military Reservation. While there were families and settlers throughout the area, the town was not incorporated until 1925. Jupiter has become a popular relocation option for families, working professionals and retirees alike. A variety of people are attracted to its scenic location, numerous amenities and low crime rate. Jupiter offers a number of special events throughout the year, a vibrant nightlife and shopping and dining options for every taste. 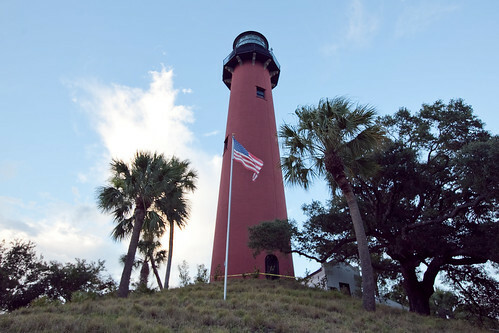 In addition, the town has several historical buildings, including the Jupiter Lighthouse, which is the oldest remaining structure in Palm Beach County. Jupiter is home to the spring training facilities of MLB's Miami Marlins and St. Louis Cardinals, making the city a popular springtime destination for sports lovers. Perhaps the best-known feature of Jupiter is its many beaches, which are an ideal place to enjoy the year-round warm weather. Some of the beaches are dog friendly, allowing dogs to play and enjoy the ocean as well. The Jupiter Jubilee is one of the city's largest events, incorporating a variety of cultural, civic, educational and entertainment elements. The festival began in 2003 and has since served as a celebration of the city's identity and unique culture. Palm Beach County Public School District serves the public schools of Jupiter. In addition to traditional schooling programs, the district offers International Baccalaureate programs, Montessori programs and the Palm Beach Virtual School. You'll find two small college campuses in the area, the Harriet L. Wilkes Honors College and Florida Atlantic University. Utilities: Jupiter Utilities facilitates the city's residential water services. Florida Power & Light (FPL) is the city's main energy provider. Garbage and Recycling: Trash, green waste and recyclables are collected twice per week. Transportation: Palm Tran is a low-cost public bus system that serves greater Palm Beach County, including Jupiter. It's considerably more expensive to live in Jupiter than other parts of the Miami-Fort Lauderdale metro area, though there is a range of options that make it possible to find something on nearly any budget. The rental market is also extremely active, with hundreds of apartments to consider on any given day. Our lowest priced units in Jupiter, FL average $88.50 per month. 135 people have reserved units in Jupiter, FL in the past 30 days. There are 2 locations within Jupiter, FL's city limits. There are 2 locations in Jupiter, FL that offer AC and Heating features.